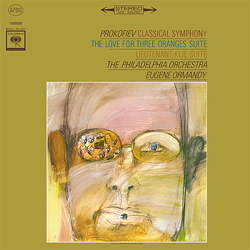 Prokofiev: Suite From The Love For Three Oranges, a.o. ﻿Sergei Prokofiev was a real expert when it came to writing short musical works with brilliant orchestration. His Op. 25, the "Classical" Symphony is not only his shortest and best known, but also the most humorous with its genial emulation of the style of Papa Haydn. The leaps and jumps, the courtly gestures and turbulent last dance flirt with the familiar style of the always slightly cool Modern music. Another entertaining and creative work is his "Lieutenant Kijé" Suite, which was originally written as film music for a satirical novella about tsarist bureaucracy. The opera "The Love for Three Oranges" is also full of irony and wit. In the story, the advocates of Tragedy, Comedy, Lyric Drama and Farce argue about how to present their own plays. How the Ridicules win the competition with their story of the love for three oranges is presented in highly imaginative musical gems, which tell of princesses, fools and magicians and culminate in everyone praising the Prince and his bride. All these characters are brought vividly to life by Eugene Ormandy and his highly competent Philadelphia Orchestra – a treat for the ears and the inner eye.